Previously, on MinerBumping... EDISON ENGLISH was furious when his mining ship was bumped out of the ice anomaly. He instructed our Agents to stop, claiming that I was his Facebook friend and that I was opposed to miner bumping. But under intense questioning from our Agents, EDISON's story fell apart. AGBee 001 > Your response should be "what can I do to make things right"
Agent AGBee 001 made it abundantly clear that she would no longer entertain EDISON's outrageous claims. No more stories, no more lies. Lillie Naari > We are the highest authority you have at your disposal. Lillie Naari > you make it right with us. Agent Lillie Naari informed the miner that he would not be getting any last-minute clemency from the Saviour of Highsec. EDISON needed to deal with the Agents currently assigned to his case. EDISON ENGLISH > so..if james/dom is out of the picture..and u now the big cheese...how canb we sort this out? Suddenly, another Agent joined the convo. Would TheInternet TweepsOnline TheInternet be more favorably disposed to EDISON? Lillie Naari > Your permit was invalidated. EDISON quickly got TheInternet up to speed--at least, as far as his side of the story was concerned. TheInternet TweepsOnline TheInternet > You believe Dom is James 315? The miner went all-in on his Facebook story. There was no turning back now. TheInternet TweepsOnline TheInternet > To begin, Dom is not James 315. Lillie Naari > Did you get your permit from CNN? Lillie Naari > Agent Jake Tapper? A devastating blow to EDISON's case: His Facebook friend "Dom" was not the Saviour of Highsec. The revelation would shatter EDISON's confidence. Unless, of course, he refused to believe it. TheInternet TweepsOnline TheInternet > You clearly haven't read minerbumping. 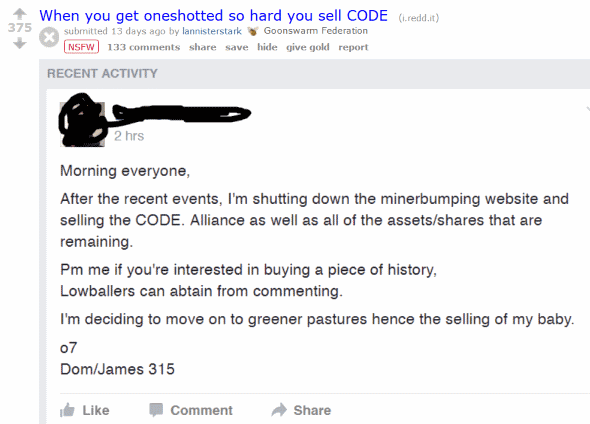 The miner confirmed that he was not a regular reader of MinerBumping. That's a grievous mistake for anyone who spends any time in highsec. TheInternet TweepsOnline TheInternet > The cost to get off the blacklist is 2B ISK. TheInternet TweepsOnline TheInternet > I suggest you contact me before this gets truly ugly. TheInternet's judgment was rendered in record time, and she promptly excused herself to attend to important business elsewhere. Needless to say, EDISON was no better off than he'd been prior to TheInternet's intervention. EDISON brushed off everything he'd heard. All that mattered was that James 315 would eventually get on Facebook and rescue him from the rogue Agents. AGBee 001 could scarcely believe the miner's ignorance--or his confidence. It was time to burst his bubble with facts. AGBee 001 threw EDISON a link to the "Ruse Kruise" series on MinerBumping. It would shed light on the source of EDISON's confusion. If he read it, that is. During the Kusions' prank on the EVE Redditors, a widely circulated Facebook post claimed that CODE. was being sold to the highest bidder. EDISON had apparently been taken in by the prank. Weeks later, no one ever bothered to tell him that it was a hoax. EDISON was too lazy to actually read the dynamite MinerBumping post. AGBee had no choice but to spoonfeed its contents to the miner. When EDISON learned the truth, would he still deny it--or would he be devastated and remorseful? Was that his cloud car? I am Dom/James and so is my wife! That miner is my buddy, so let him be! Ahh wait, it happened already. I was too late! NO I am James and I say let him live. No no no, kill the F*** outta the guy, hahaha hope he leaves Eve for good. James 315 is really Donald Trump and your FIRED! I bet the miner completely fails to acknowledge being caught in a contradiction, sticks to his story, and has to be ganked again. Haha. I had completely forgotten that that reddit post had referred to James as Dom. I was wondering where the **** he had gotten Dom from. This is not gonna end well for that miner. Jeezus, this is fail from a month ago. Git gud ag, ffs. The final soultion to the carebear question? Genocide F*** YEAH, gonna implement the final solution. Genocide F*** YEAH, ganking miners is the only way now.